The Domer family came to Okeechobee, Florida from Sugarcreek, Ohio by way of West Palm Beach, Florida. In 1920 Victor Jacob Domer (1893-1964), his wife Emma Elizabeth Disler Domer (1895-1968), their one year old daughter, Esther, and some friends who also lived in Sugarcreek, Ohio made an adventurous trip via two cars to visit the friend’s winter home in West Palm Beach. Their drive south took twenty-two days and included many stops asking for directions since road maps were scarce in 1920. Their six month stay in West Palm Beach convinced Victor that there was definitely not any snow shoveling down here therefore he began making preparations for their eventual move to Florida. Russell Victor Domer was born in 1922, two years later in 1924 the family made their permanent move to Florida where Victor built a home in West Palm Beach. Throughout the next year Victor worked various jobs learning additional trades to add to his original one of watchmaker jeweler, for which he had to serve a long apprenticeship and had established a flourishing business in Sugarcreek, Ohio. The Domers took a real estate tour on the newly completed Conners Highway toll road to the city that was being called “the future Chicago of the south” and what some at the time wanted to make the Florida state capital; Okeechobee. 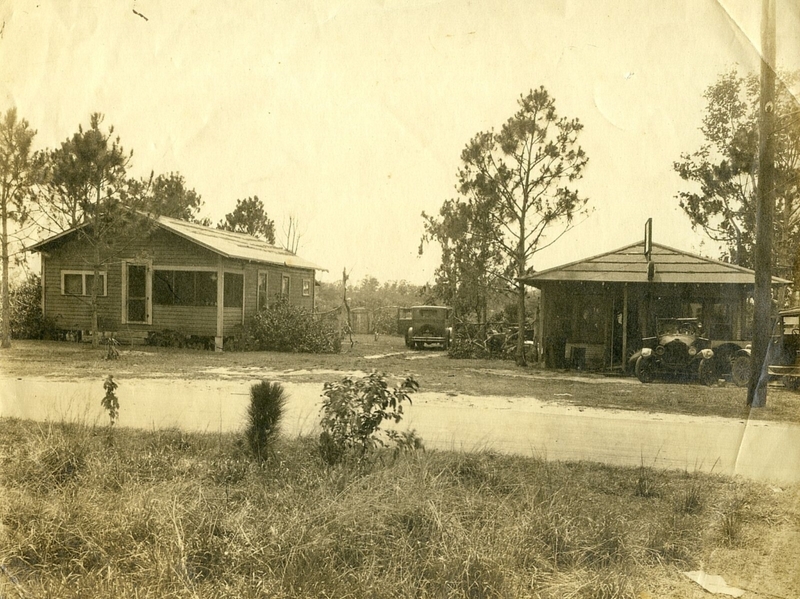 In December of 1925 Victor sold their home in West Palm Beach and bought a partially finished home in Okeechobee on Hancock Street which is now Southeast 10th Avenue. 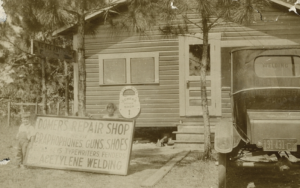 The flourishing town of Okeechobee was in great need of a talented mechanic, especially one of Victor’s caliber, so he was readily accepted into the community. Victor’s motto “You break it, we fix it!” quickly became his trademark and not only did he claim this, but he did it. Not long after the Domer family moved to Okeechobee; the city, state, and country were all hit with hard times. The hurricane of 1926 devastated south Florida with a great deal of water and wind damage making it seem like the Great Depression fell upon Florida before the rest of the country felt the effects. Victor’s diverse talents made possible the repair of things which people had no money to replace so the Domer family fared better than most even if the barter system had to be used in order to pay for Victor’s repair services. 1928 brought another hurricane to the area with even more devastation than the prior 2 years earlier. This seemed to drown any hope that the residents had begun to revive after the last blow of 1926. After many residents left the area Victor adopted a personal policy to do his best to improve the community. One way he did this was to donate a building that was used as the first Church of the Brethren. 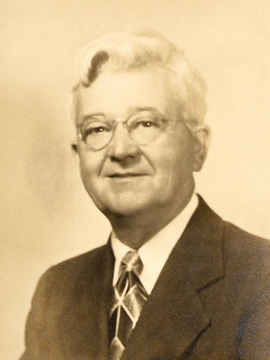 His wife, Emma, was a very integral part of the conception of the Okeechobee Grace Brethren Church as well. Victor continued his passion for his community by appointment to fill a vacant seat on the Okeechobee City Council from January through September 1933 and later being elected to serve from January 1935 until January 1937. Victor knew that he needed to adapt the services of his business to the needs of the local industry as it progressed and changed. He started off repairing things like watches, guns, shoes, locks, typewriters, and gramophones. 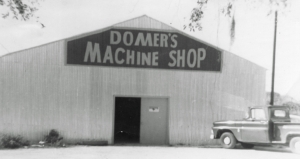 He later incorporated welding, fabricating livestock branding irons, water well drilling, and pumps; Domer’s has been selling Goulds pumps since the 1930s. 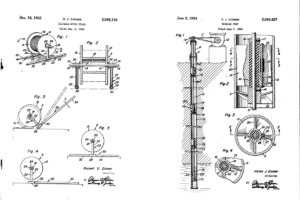 Victor later designed his own turbine pump and was granted a U.S. patent for it on June 2, 1953. Russell Victor Domer (1922-1994), the only son of Victor and Emma Disler Domer, enlisted to serve in WWII sometime in 1942 but was not called to enter the service until January 31, 1943 as an aviation cadet in the Army Air Corp. Russell married Martha Alvina Walker (1925-2013) on March 21, 1944, the great-granddaughter of Okeechobee founders Peter and Louisiana Chandler Raulerson. Russell toured Europe during the Second World War as a 2nd Lieutenant and member of the 460th Bomb Group, 55th Bomb Wing, and 15th Air Force, stationed at Spinazzola, Italy. He was a bombardier on a B-24 aircraft. 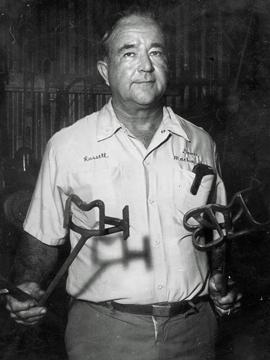 Russell returned to his family in Okeechobee where he worked at and eventually bought the business in 1957. Prior to this Russell and Martha became the parents of three children; Alvina Domer Robertson, Jean Domer Rogers and Ray Russell Domer. Russell was well known for the lawnmowers that he designed and built that would withstand the tough terrain of Okeechobee at the time. Local farmers also utilized these mowers to chop feed for their cattle. 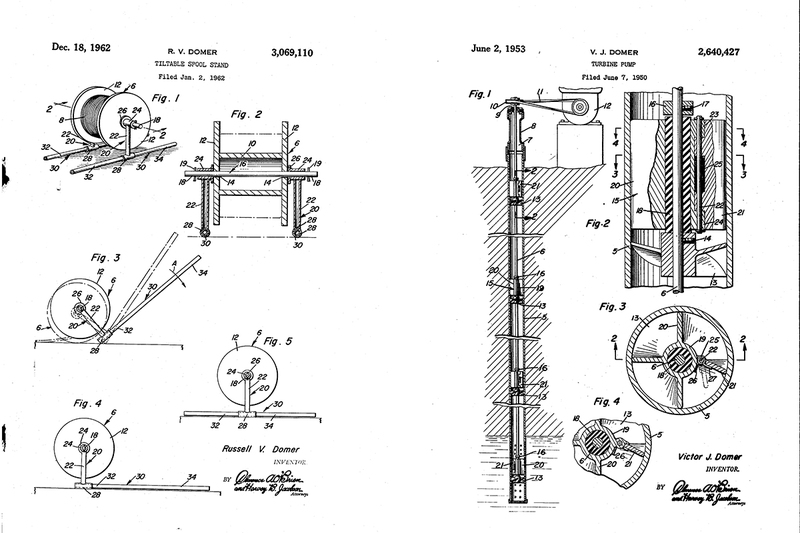 He followed in his father’s footsteps by gaining his own U.S. patent on December 18, 1962 for a tilt-able spool stand. He later became active in the community being named a Master of the Okeechobee Masonic Lodge three times (1966, 1968, and 1969) and was also elected to the Okeechobee City Council in 1971 and served until 1979. Russell was named chairman of the city council on September 17, 1974. Ray Russell Domer (1956-2014), the only son of Russell and Martha Walker Domer, was born and raised in Okeechobee. After graduating from Okeechobee High School in 1974 he attended Indian River Community College for about a year and a half but then decided he needed to spread his wings. This led Ray to pack up his car and start driving; he wound up in Baton Rouge, Louisiana and found work in the ship yards. 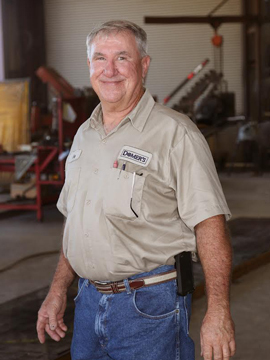 By utilizing the skills he learned working in the family business he worked his way up to foreman. In 1978, his father contacted Ray to let him know that it was time to move home to buy the business or it would be sold to someone outside of the family. So Ray packed up and moved back home to Okeechobee to buy the multi-generational company at the age of 22 years old. In 1982, Ray married the late Ginger Greenberger Domer (1956-1987). In 1987, the couple welcomed son Justin to their family. In 1989, Ray married Cynthia (Cindi) Woodham Domer in Roseburg, Oregon. Cindi quickly stepped into the role of mother to Justin and the family welcomed son Jacob in 1995. Ray and Cindi gave birth to, but sadly lost daughter Nettie Graceson in 1996. Like his predecessors, Ray knew that in order for a long-standing business to continue you must grow and adapt. While remaining on the same land his great-grandfather originally purchased in 1925 he gave the business a facelift. He built the required buildings and purchased the equipment necessary to do business in today’s world. Ray was also passionate about continuing his family’s dedication to public service in Okeechobee County. In November 2004, Ray upheld this tradition when he beat a second-term incumbent and was elected to the Okeechobee County Commission. Ray proudly continued to serve his community with subsequent reelections in both 2008 and 2012. In addition to his service as a County Commissioner, Ray also was a dedicated member of the Okeechobee Masonic Lodge for over thirty-five years. Ray’s untimely death in August of 2014 brought with it a decision that his two sons did not expect to have to make so early in their lives. 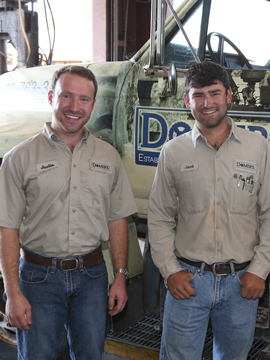 Justin Ray Domer and Jacob H. Domer, both seventh-generation Floridians and graduates of Okeechobee High School decided that it would be an honor to continue the legacy that their great-grandfather started almost 90 years prior. Justin is a 2010 graduate of the Florida State University with a bachelor of science in political science, a minor in business, and a certificate in planning studies. Prior to graduating from Florida State Justin interned in the Executive Office of the Governor, this led to multiple positions within the office. His last placement in the Governor’s office was regional representative for Governor Rick Scott, covering multiple counties in southeast Florida. This post moved him back down to south Florida for the first time since leaving home to move to Tallahassee in 2005. In 2012 after much thought and discussion with Ray, Justin decided that he wanted to become a part of the family’s business so he moved back to Okeechobee to learn first-hand from his father. Jacob attended Indian River State College has been actively involved in the business as long as he can remember. From welding to well drilling he has abilities and talents way beyond his years. Justin and Jacob are working alongside each other and their supportive team with the primary goal of continuing their family’s legacy.